Who knew stacking cards could be so much fun. 3Up 3Down is an exciting card game where players lay down cards in a pile that either match or are higher in value with the goal to get rid of all their cards first. Sound easy? Get ready for some fun twists, special cards and unique rules that make this game very entertaining. 3Up 3Down is an awesome family friendly game that younger and older kids will like. It's quick to learn how to play and doesn't take very long to find your champion. Rematches are a must and will keep the fun competition going. Add 3Up 3Down to your game collection and you'll be glad you did. Review Completed (2019-04-07) 3Up 3Down is kind like if Scum, Phase 10 and Uno all hung out on the weekend and created a new card game. While the game isn’t exactly like any of these games, they have some distant similarities. We felt there were three distinct phases: get rid of the deck, get rid of your up cards and get rid of your down cards. All while playing in these three phases no one is safe from not having to pick up the deck which sets you back a bit. Because there is a large element of luck in the game, all players stay pretty even with each other which creates a fun competitive race to the end. The first part of the game where you're trying to exhaust the draw pile seems slightly pointless. If someone does really good, it only helps everyone get closer to their piles. When you get your first big pile from the middle you think you'll never be able to get rid of them. Wrong you are since this actually gives you an advantage and they are gone rather quickly. 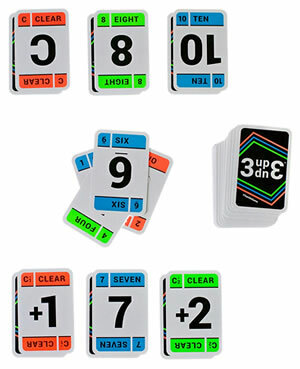 While we only played with four players, it can be played with six or even more if you purchase an additional set. We really liked that idea so larger groups can play. We even noticed there were some additional rules that you could implement to give a different spin on the game. While we didn’t use any of them during our games, we think they would be a lot of fun. They claim it takes three minutes to learn and ten minutes to play. We cheated a bit and watched their how to play video which helped us get started very quickly. After you get an idea of how the game is played, the rules are a great backup to remind you of the small details. Every once is a while you’ll get someone that gets lucky and wins quickly or someone that has downright bad luck. However, we found on average the game time was accurate. We are really liking the games produced by OK 2 Win (maker of 3Up 3Down). They have very nicely produced games both in their build quality as well as their ability to create fun simple games for almost anyone to play. Even kids younger than the recommended age can play with a little help. The game has fun colors, simple rules, plays quickly (no waiting for someone to decide what to do) and we really enjoyed it. 3Up 3Down will be played over and over by us for sure. Be the first to discard all of your cards and you'll win. Included are 84 cards and the official 3Up 3Down game rules and instructions. 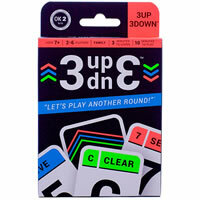 Please keep in mind that the official 3Up 3Down dice-card rules and instructions could be different depending on the game version you have. The rules below are some of the exact directions on how to play 3Up 3Down. Share with us your comments, funny stories, tips, advice, strategies, creative ways to play, questions about how to play, problems with the rules or anything you want about 3Up 3Down. All submissions will be reviewed within 24 hours. Click here to add your 3Up 3Down comments.